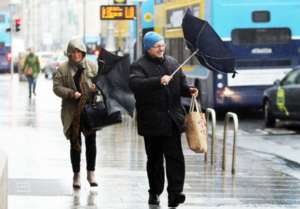 Wet and windy with heavy rain, especially over Munster and south Leinster with risk of spot flooding. Top temperatures 8 to 11 degrees in very strong and gusty southeasterly winds. 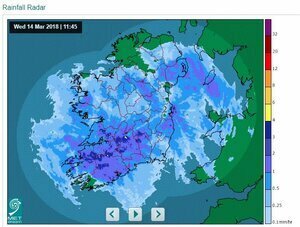 Posted in Misc and tagged Met Eireann, rain, weather at 12:05 pm on March 14, 2018 by Bodger. Fine soft day, thank God. I nearly got blown off me bike stopped at traffic lights on the way in, so strong was an gaoth. It’s rainy, and it’s windy. Happens regularly. We even get snow now and again. Nothing to write home about. Yep. 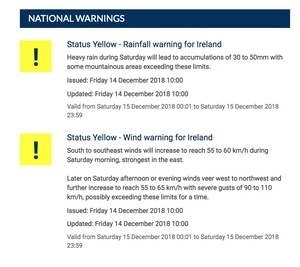 the weather continues….. but new modern day 2018 weather seems to bring with it a weather warning on a rainy day. How is it now that Met Eireann have a twitter account weather has become so dangerous we are not even allowed out at times. As a young school going man, I braved all the elements of Irish weather, both rain, snow, hail, thunder storms, lightening, anything that could happen I grimmed and suffered on; all the while I didn’t have a twitter account and I managed to get around without the propaganda fear that is being pushed at us. No doubt Leo’s SCU took over the Met Eireann twitter account to continue their scare mongering.